Royal Caribbean International’s Symphony of the Seas, the new sound of adventure, made her highly anticipated debut to the cruise capital of the world today, forever changing the status-quo on vacations for adventure-seekers everywhere. 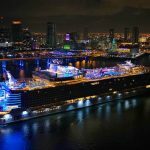 Fresh from her inaugural Europe season, the world’s largest and most adventure-packed ship sailed into her permanent, year-round home at Royal Caribbean’s brand new, state-of-the-art Terminal A at PortMiami, the largest cruise terminal in the U.S. The two-story Ultimate Family Suite for eight guests includes an in-suite slide, air hockey table, building block wall and “Royal Genie” concierge. The high-energy Boardwalk with activities for all ages, including game-day favorites at Playmaker’s Sports Bar & Arcade, the Sugar Beach specialty candy and ice cream shop, face painting, caricature artists, live music and more. New restaurants including Hooked Seafood, featuring fresh New England-style favorites, and made-to-order Mexican “street fare” at El Loco Fresh. An out-of-this-world, glow-in-the-dark laser tag experience called Battle for Planet Z. An always-evolving Royal Caribbean app, designed to be a game changer for the guest experience, enables expedited arrival, more personalized experience on board and interactive onboard features. The Ultimate Abyss, the tallest slide at sea, a 10-story test of courage. The Perfect Storm, a trio of thrilling multistory waterslides named Cyclone, Typhoon and Supercell. Two FlowRider surf simulators, pumping 34,000 gallons of water per minute, perfect for adventure-seekers wanting to hang ten. Twin rock-climbing walls, standing at 40 feet tall and boasting stunning sea views. A zip line nine decks high, speeding riders 82 feet across an open-air atrium. AquaTheater, an open-air theater with jaw-dropping, high-diving acrobatic and aquatic performances in the deepest pool at sea. Central Park, a green sanctuary lush with more than 20,000 living plants and trees. The official naming ceremony for Symphony of the Seas will take place on Nov. 15, 2018, during the pre-inaugural celebration hosted by the ship’s first-ever Godfamily – actors and avid Royal Caribbean fans Carlos and Alexa PenaVega, along with their toddler son Ocean. The 25th ship in Royal Caribbean’s fleet, Symphony of the Seas encompasses 228,081 gross registered tons, measures 238 feet tall and spans 1,188 feet in length. Each week, Symphony will welcome 5,518 guests at double occupancy in 2,759 staterooms, including 28 additional balcony rooms that overlook the ocean or the ship’s signature Boardwalk neighborhood. Royal Caribbean International is an award-winning global cruise brand with a 49-year legacy of innovation and introducing industry “firsts” never before seen at sea. 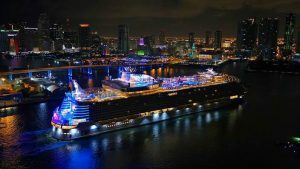 The cruise line features an expansive and unmatched array of features and amenities only found on Royal Caribbean, including jaw-dropping, state-of-the-art entertainment and industry-acclaimed programming that appeals to families and adventurous vacationers alike. On board, guests are catered to with the cruise line’s world-renowned friendly and engaging service by every staff and crew member. Royal Caribbean has been voted “Best Cruise Line Overall” for 15 consecutive years in the Travel Weekly Readers’ Choice Awards. The cruise line sails 25 of the world’s most innovative cruise ships to the most popular destinations in Bermuda and the Caribbean, Europe, Canada and New England, Alaska, South America, Asia, and Australia and New Zealand. Media can stay up-to-date by following @RoyalCaribPR on Twitter, and visiting RoyalCaribbeanPressCenter.com.